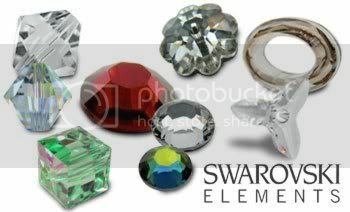 Large 2028 SS40 Swarovski Flat Backs – Hard-To-Find Stock Opportunity! “Everyone’s Using Them!” The large SS40 Flat backs are the hottest Flat backs for summer and are sure to remain as popular going into Fall and Winter. They’re seen everywhere on fashion clothing, shoes, eyewear, home décor, and do-it-yourself crafts! Free Freight Alert! This Wednesday June 30th! Place an order of $250 or more with one of our sales associates this Wednesday, June 30th, and receive FREE Ground Freight! 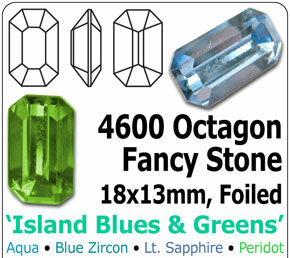 This week’s “Item of the Week” is the Swarovski 4600 18x13mm Octagon Fancy Stones in Island Blues and Greens perfect for Paradise-Inspired designs for Summer! Available in Aqua, Blue Zircon, Lt. Sapphire, and Peridot! 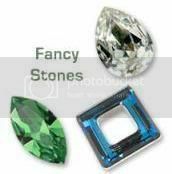 These large fancy stones are perfect for summer jewelry fashions. An easy design idea is to wire wrap a single large stone on a heavy cord and feature it as a pendant-type necklace. Call Your Sales Associate Today at 800-333-4144 To Place Your Orders! Be the First With The New Indian Siam and Dark Siam Red Hot Colors! SWAROVSKI ELEMENTS is now offering two new colors that are Red-Hot for Summer! Indian Siam and Dark Siam. These two colors are available in most of the popular selling 1028s, 1100s, 2000s and 2028s in Hotfix and No Hotfix, and some popular selling 4000 series Fancy Stones. Not only are reds hot for summer, they are also going to be a huge color trend for Fall/Winter 2010! Or call a Sales Associate Today at 800-333-4144! Be The First with This Smoking HOT Stock! Free Shipping on Swarovski Crystal Pearls in Cool Summer Colors! After attending the Bead and Button Show in Milwaukee earlier this month, we met alot of people interested in the Swarovski Crystal Pearls. Crystal Pearls are a great alternative to expensive, genuine pearls. These pearls are made with an innovative pearl coating, giving them a silky, smooth, flawless look. Available in a bunch of amazing colors, these pearls give you the look of timeless tradition, with the option to add your personality! Oh! and they are also scratch and UV ray resistant, isn’t that PERFECT? This week take advantage of our “Pearls are Perfect” Promotion! Get free shipping on Cool Summer colors like White, Cream, Creamrose, Creamrose Lt., Rosaline, Powder Rose, Lavender(NEW), Light Blue, Powder Green and Coral in ALL SIZES ranging from 3mm – 12mm! These pearls are perfect for All-Pearl necklaces, earrings, bracelets, or rings, but are also great as mix-in accents on all jewelry creations! Merchants Overseas is Back from The Bead and Button Show 2010! Every year we participate in the Bead and Button Show because it is the largest bead show of its kind and it the experience is always amazing every year. This year the show celebrated their 10 year anniversary and we got to even enjoy some birthday cake! 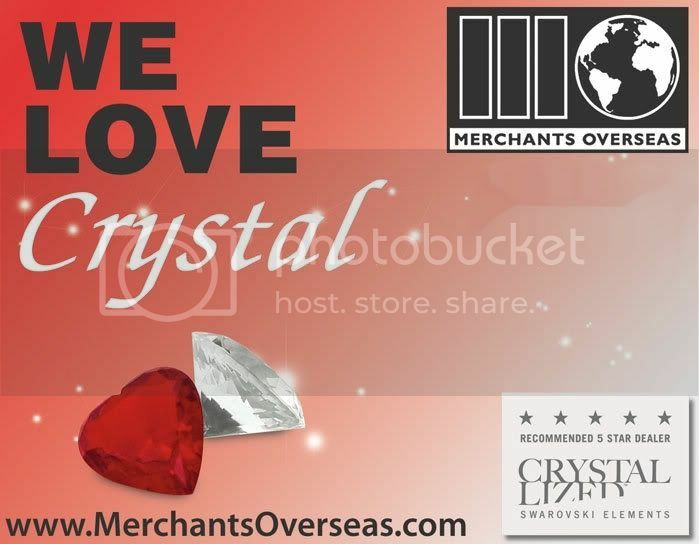 This year Merchants Overseas had an exhibit at booth 633 and we revamped our booth to include some easy and convenient display racks that allowed us to hang and showcase our products. 1 display had our Beadelle Collection and the other had some popular selling SWAROVSKI ELEMENTS like the 5328 bicone beads, 5601 cube beads, and 2028 Flat backs. 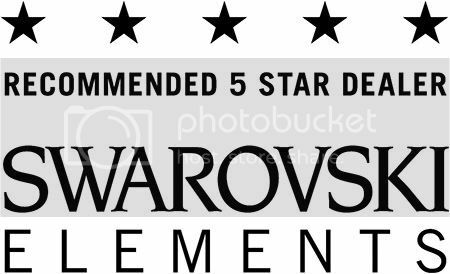 This year we were lucky enough to have 2 product demonstrations by 2 very amazing and talented Swarovski Ambassadors, Stephanie Dixon and Debbi Simon. Our first demo was done by Debbi Simon, and she demonstrated some wire techniques which she used to make a beautiful necklace and bracelet. The necklace incorporated a beautiful Silver/Crystal Beadelle Pave Oval Magnetic Clasp, 8mm Beadelle Round Pave Beads in Silver/Peridot and Silver/Amethyst, and some large 6106 Pear shaped Swarovski Pendants. The necklace was made with metal and 3 rows of Amethyst 6010 Briolette Pendants. It was stunning! Stephanie Dixon’s demo was completely different! She demonstrated her crocheting skills and showed our viewers the new Swarovski Crystal Yarn products. To view the video of Stephanie’s Demo LIVE visit our facebook page!